This document provides updated interim guidance on the use of facemasks and respirators for decreasing the exposure to 2009 influenza A (H1N1) virus. This guidance replaces other CDC guidance on mask and/or respirator use that may be included in other CDC documents in regards to the outbreak of 2009 H1N1 virus. No change has been made to guidance on the use of facemasks and respirators for health care settings. This document includes guidance on facemask and respirator use for a wider range of settings than was included in previous documents and includes recommendations for those who are at increased risk of severe illness from infection with the 2009 H1N1 virus compared with those who are at lower risk of severe illness from influenza infection. For more information about human infection with 2009 influenza A (H1N1) virus, visit the CDC H1N1 Flu website. Other CDC 2009 H1N1 guidance will be updated with the information contained in this document as soon as possible. Detailed background information and recommendations regarding the use of facemasks and respirators in non-occupational community settings can be found on PandemicFlu.gov in the document Interim Public Health Guidance for the Use of Facemasks and Respirators in Non-Occupational Community Settings during an Influenza Pandemic. Information on the use of facemasks and respirators in health care settings is available. Facemasks: Unless otherwise specified, the term ”facemasks” refers to disposable facemasks cleared by the U.S. Food and Drug Administration (FDA) for use as medical devices. This includes facemasks labeled as surgical, dental, medical procedure, isolation, or laser masks. Such facemasks have several designs. One type is affixed to the head with two ties, conforms to the face with the aid of a flexible adjustment for the nose bridge, and may be flat/pleated or duck-billed in shape. Another type of facemask is pre-molded, adheres to the head with a single elastic band, and has a flexible adjustment for the nose bridge. A third type is flat/pleated and affixes to the head with ear loops. Facemasks cleared by the FDA for use as medical devices have been determined to have specific levels of protection from penetration of blood and body fluids. Facemasks help stop droplets from being spread by the person wearing them. They also keep splashes or sprays from reaching the mouth and nose of the person wearing the facemask. They are not designed to protect against breathing in very small particle aerosols that may contain viruses. Facemasks should be used once and then thrown away in the trash. When respiratory protection is required in an occupational setting, respirators must be used in the context of a comprehensive respiratory protection program as required under OSHA’s Respiratory Protection standard (29 CFR 1910.134). This includes fit testing, medical evaluation and training of the worker. When required in the occupational setting, tight-fitting respirators cannot be used by people with facial hair that interferes with the face seal. For the purpose of this document, respirator refers to N95 or any other NIOSH-certified filtering face piece respirator. Persons at increased risk of severe illness from influenza (i.e. high-risk persons) include those groups at higher risk for severe illness from seasonal influenza, including: children younger than 5 years old; persons aged 65 years or older; children and adolescents (younger than 18 years) who are receiving long-term aspirin therapy and who might be at risk for experiencing Reye syndrome after influenza virus infection; pregnant women; adults and children who have pulmonary, including asthma, cardiovascular, hepatic, hematological, neurologic, neuromuscular, or metabolic disorders, such as diabetes; adults and children who have immunosuppression (including immunosuppression caused by medications or by HIV); and, residents of nursing homes and other chronic-care facilities. The optimal use of respirators requires fit testing, training and medical clearance. Proper use is recommended to maximize effectiveness. The use of facemasks may be considered as an alternative to respirators, although they are not as effective as respirators in preventing inhalation of small particles, which is one potential route of influenza transmission. There is limited evidence available to suggest that use of a respirator without fit-testing may still provide better protection than a facemask against inhalation of small particles. Respirators are not recommended for children or persons who have facial hair (see FDA website). 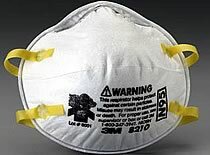 Use of N95 respirators or facemasks generally is not recommended for workers in non-healthcare occupational settings for general work activities. For specific work activities that involve contact with people who have influenza-like illness (ILI) (fever plus at least either cough or sore throat and possibly other symptoms like runny nose, body aches, headaches, chills, fatigue, vomiting and diarrhea), such as escorting a person with ILI, interviewing a person with ILI, providing assistance to an individual with ILI, the following are recommended: a) workers should try to maintain a distance of 6 feet or more from the person with ILI; b) workers should keep their interactions with the ill person as brief as possible; c) the ill person should be asked to follow good cough etiquette and hand hygiene and to wear a facemask, if able, and one is available; d) workers at increased risk of severe illness from influenza infection (see footnote 3) should avoid people with ILI (possibly by temporary reassignment); and, e) where workers cannot avoid close contact with persons with ILI, some workers may choose to wear a facemask or N95 respirator on a voluntary basis (See footnote 1). When respirators are used on a voluntary basis in an occupational work setting, requirements for voluntary use of respirators in work sites can be found on the OSHA website. See case definitions of confirmed, probable, and suspected 2009 influenza A (H1N1). Also see infection control in the health care setting. When respiratory protection is required in an occupational setting, respirators must be used in the context of a comprehensive respiratory protection program as required under OSHA’s Respiratory Protection standard (29 CFR 1910.134). This includes fit testing, medical evaluation and training of the worker. “Caring” includes all activities that bring a worker into proximity to a patient with known, probable, or suspected 2009 H1N1 or ILI, including both providing direct medical care and support activities like delivering a meal tray or cleaning a patient’s room. See definitions for confirmed, probable, and suspect 2009 influenza A (H1N1) infection. Also see information on infection control in health care settings. Ill persons should be placed in well ventilated areas when possible and placed in areas where at least 6 feet distance can be maintained between the ill person and other well and ill persons. Selected references: a) Blumenfeld HL, et al. J Clin Invest 1959;38:199-212. b) Bridges CB, et al. Clin Infect Dis 2003;37:1094-1101. c) Foster MG and Cookson AH. Lancet 1918 (Nov. 2): 588-90. d) Gregg MB. Ann NY Acad Sci 1980;353:45-53. e) WHO. Infection prevention and control of epidemic- and pandemic-prone acute respiratory diseases in health care. June 2007. f) Fabian P, et al. Plos One 2008;3:e2691.